Rock Salt Or Table Salt? 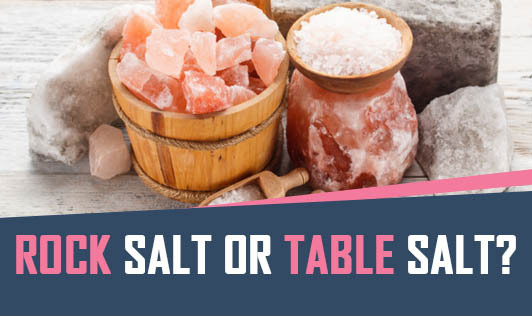 Is there a difference between rock salt and table salt? In appearance, yes. In palatability, perhaps. In nutrition, negligible. Rock salt, sea salt, black salt (kala namak), table salt are different forms of the same chemical composition - sodium chloride (NaCl). The differences lie in their appearance and sometimes taste. Sea salt, rock salt and black salt are less processsed than table salt and might contain impurities. They retain miniscule amounts of trace minerals depending upon where they are formed. Since table salt is more processed, it does not contain extra minerals. Commercially available table salt might contain an additive to prevent it from forming lumps. Table salt is also available in it's iodised version and low-sodium version. Iodine is added to enhance the intake of this mineral, in iodised salt. This is particularly useful in iodine-deficient population. Low-sodium salt is used by those suffering from high blood pressure, especially if they are salt-sensitive. In low-sodium salt, part of the sodium chloride is replaced with potassium chloride to help control the blood pressure better. No matter what salt you use, make sure it does not exceed the recommended allowance of 5 g per day per person.